This week I manged to get out early and I was able to spend the evening chatting it up, playing a small game and doing a little bit of painting. One of the guys was excited to show me the tanks he got in the mail earlier in the day. 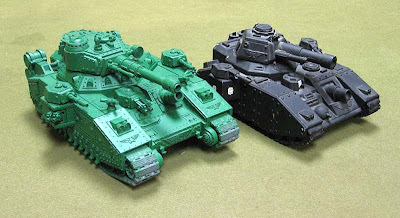 There were actually a bunch of them, but I thought it was really cool to see one of the new Baneblades next to one of the older Armorcast models. You can click on the pic above to see the tanks up close. I also manged to sneek a peek at a new Salamander army in the works by one of the other guys (the same guy with the Orks from last week). Once he gets some units painted up, I'll have pictures of them. I've challenged him to a 1500 point game next week, he's running a pair of Land Raiders in his force too. Hopefully I'll have more of this army next week as well. One of our guys has a great looking Daemon army that he's putting the finishing touches on right now. He's finishing up some pink Horrors. While we waited for the pizza to arrive, we sat around and talked about different hobby stores and the personalities that certain ones seem to develop. It's fun to look back and remember your first store and remember all the games you played there. Of course, the issue of pay to play came up. We are incredibly fortunate that our store (Game Vault) supports us to no end with just about everything we could ask for in a hobby store. 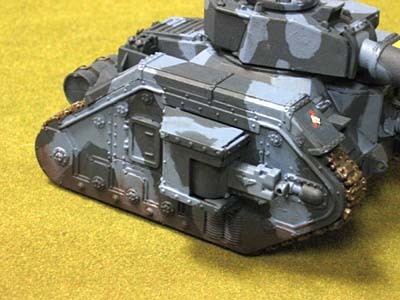 Last week, we decided we would do some basic tank weathering this week. Nothing fancy that requires expensive materials or techiniques, just a few simple things you can do to turn your models from pristine tanks into battle worn machines. And it really doesn't take much, some drybrushing, a wash or two and you're all set. 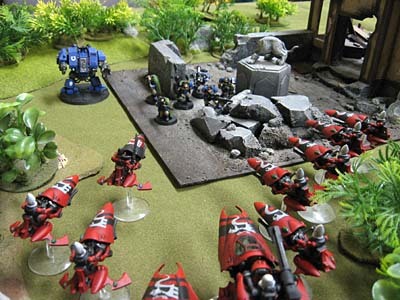 Taking an extra minute to add details like this can help make your army stand out on the tabletop. 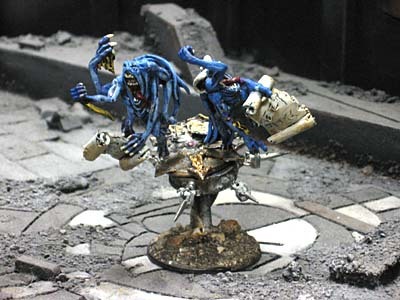 Some people are fantastic with this stuff and can produce amazing results like The Painting Corps or misterjustin. Me, I just go for the simple, quick techniques with my stuff. The game I did get in was at 400 points and even thought I barely won, Eldar just aren't my army. I realize this now. Don't get me wrong, I still think they're super cool with all the jetbikes and such, but Eldar just aren't my style. There's something about Deathwing. On a completely unrelated note, anyone interested in buying a partially complete Saim-Hann force? My opponent was one of the new guys and has just started playing, so it was the perfect game for both of us. Between the two of us, we knew about 5 rules for our individual armies. I think we spent as much time flipping pages in our books as we did actually moving models around. Good thing for me it ended on turn 5, if it went any further, it probably would have been a different outcome. Nonetheless, the game was a blast. That's it for this week, next week I go head to head with an army similar to mine... we'll see how I do.